A widget which popups to assist in editing a textarea or lineedit. This widget may be associated with one or more WFormWidgets (typically a WLineEdit or a WTextArea). WSuggestionPopup is an MVC view class, using a simple WStringListModel by default. You can set a custom model using setModel(). The model can provide different text for the suggestion text (Wt::DisplayRole) and value (editRole()). The member methods clearSuggestions() and addSuggestion() manipulate this model. By default, the popup implements all filtering client-side. To support large datasets, you may enable server-side filtering of suggestions based on the input. The server-side filtering may provide a coarse filtering using a fixed size prefix of the entered text, and complement the client-side filtering. To enable server-side filtering, use setFilterLength() and listen to filter notification using the modelFilter() signal. Whenever a filter event is generated you can adjust the model's content according to the filter (e.g. 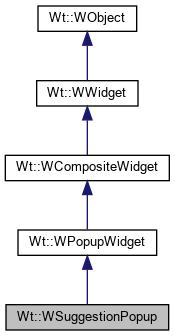 using a WSortFilterProxyModel). By using setMaximumSize() you can also limit the maximum height of the popup, in which case scrolling is supported (similar to a combo-box). // fetch the location of cursor and current text in the editElement. // return a function that matches a given suggestion with the current value of the editElement. // editElement is the form element which must be edited. // suggestionText is the displayed text for the matched suggestion. // suggestionValue is the stored value for the matched suggestion. To style the suggestions, you should style the <span> element inside this widget, and the <span>. "sel" element to style the current selection. When using the DropDownIcon trigger, an additional style class is provided for the edit field: Wt-suggest-dropdown, which renders the icon to the right inside the edit field. This class may be used to customize how the drop down icon is rendered. Enumeration that defines a trigger for showing the popup. Shows popup when the user starts editing. The popup is shown when the currently edited text has a length longer than the filter length. Shows popup when user clicks a drop down icon. The lineedit is modified to show a drop down icon, and clicking the icon shows the suggestions, very much like a WComboBox. The popup using a standard matcher and replacer implementation that is configured using the provided options. Creates a suggestion popup with given matcherJS and replacerJS. Signal emitted when a suggestion was selected. The selected item is passed as the first argument and the editor as the second. This adds an entry to the underlying model. The suggestionText is set as Wt::DisplayRole and the suggestionValue (which is inserted into the edit field on selection) is set as editRole(). Clears the list of suggestions. This clears the underlying model. Returns the last activated index. Returns -1 if the popup hasn't been activated yet. Returns the role used for editing the line edit. Signal that indicates that the model should be filtered. The argument is the initial input. When Editing is used as edit trigger, its length will always equal the filterLength(). When DropDownIcon is used as edit trigger, the input length may be less than filterLength(), and the the signal will be called repeatedly as the user provides more input. Lets this suggestion popup assist in editing an edit field. A single suggestion popup may assist in several edits by repeated calls of this method. The popupTriggers control how editing is triggered (either by the user editing the field by entering keys or by an explicit drop down menu that is shown inside the edit). Removes the edit field from the list of assisted editors. The editor will no longer be assisted by this popup widget. Sets a default selected value. row is the model row that is selected by default (only if it matches the current input). The default value is -1, indicating no default. When drop down icon is clicked the popup content will be unfiltered. Sets the role used for editing the line edit with a chosen item. The default value is UserRole. Sets the minimum input length before showing the popup. When the user has typed this much characters, filterModel() is emitted which allows you to filter the model based on the initial input. The filtering is done as long as the model indicates that results are partial by setting a StyleClassRole of "Wt-more-data" on the last item. Controls how the popup is positioned (deprecated). this option is now ignored, since the popup is automatically positioned to behave properly. Sets the model to be used for the suggestions. The model may not be 0, and ownership of the model is not transferred. The default value is a WStringListModel that is owned by the suggestion popup. The Wt::DisplayRole is used for the suggestion text. The editRole() is used for the suggestion value, unless empty, in which case the suggestion text is used as value. Sets the column in the model to be used for the items. The column index in the model will be used to retrieve data. Shows the suggestion popup at an edit field. This is equivalent to the user triggering the suggestion popup to be shown.